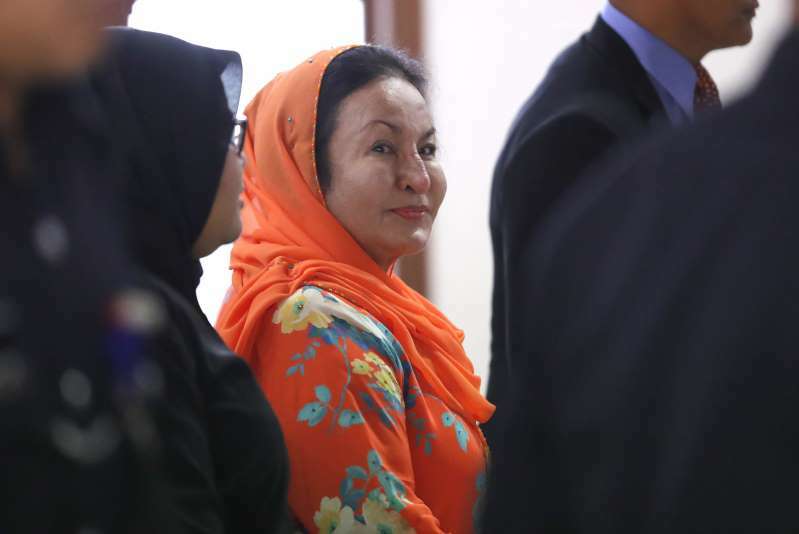 The detained wife of former Malaysian Prime Minister Najjib Razak pleaded not guilty Thursday to laundering illegal proceeds from a graft scandal involving the 1MDB state investment fund, five months after her husband's shocking electoral loss. Najib, 65, didn't speak to reporters but in a tweet late Wednesday after his wife's arrest, he said he will not cease praying and will put his trust in Allah. Police found hundreds of luxury handbags, jewelry and cash — worth more than $266 million — during raids on apartments linked to the family shortly after Najib's shocking electoral defeat in May. Seized were 567 handbags, 423 watches and 12,000 pieces of jewelry, including 1,400 necklaces, 2,200 rings, 2,800 pairs of earrings and 14 tiaras. Najib has said the items were mostly gifts to his family. In a biography in 2013, Rosmah said it was common for a prime minister's wife to receive expensive jewelry and gifts. She also said she had earned millions of ringgit from her own music album, which wasn't released to the public but was bought by government ministers who were fans of her singing talent. Her daughter Nooryana Najwa Najib, echoing Najib's claim that the government was seeking political vengeance against him, has slammed the government for going after the family. "I can accept taking action on a man who was in power, but putting the women in his life in harm's way is going too far," she wrote on Instagram late Wednesday, citing a recent police raid on the house of Najib's mother as well as Rosmah's arrest. Public anger over the scandal eventually led to the ouster of Najib's long-ruling coalition in May 9 elections that ushered in the first change of power since Malaysia's independence from Britain in 1957. New Prime Minister Mahathir Mohamad reopened investigations into 1MDB that were suppressed under Najib's rule and banned the couple from leaving the country.